"These ribs are a new spin on a Dinosaur classic--coated in RITZ cracker crumbs then pan fried until crispy. For added flavor and a little kick, we've paired them with a Zesty Buttermilk Ranch dressing. At Dinosaur Bar-B-Que we're known for our delicious ribs, and this recipe is just that: delicious and perfect for parties." Put a wire rack over a shallow baking pan and pour 1 cup of water into the pan. Season the ribs with a pinch of salt and pepper. Place the ribs on rack, meaty side up. Slide them into the oven and roast slowly. Check every hour or so for doneness. Roast until you can gently tear the meat between the bones, or they reach an internal temperature of 180 degrees F, about 2 1/2 to 3 hours. Remove from oven and set aside to cool completely. When ribs are cooled, cut into individual ribs. Pulse RITZ Crackers into crumbs in a food processor to make about 2 cups crumbs. Mix crumbs with granulated garlic, kosher salt and coarse black pepper. Coat each rib in flour, dip in egg wash, and then coat with RITZ crumb mixture. Set aside. Heat oil in deep 9-inch skillet to 350 degrees F. Place ribs meat side down into hot oil (ribs should be about 3/4 covered). Fry in batches, being careful not to overcrowd pan as this will bring down the oil temperature. Cook approximately 1 1/2 to 2 minutes until ribs are crispy and golden brown. Remove ribs from pan; drain on paper towels. While ribs are still hot, season with 2 tablespoons Cajun seasoning. Serve with Zesty Buttermilk Ranch Dressing. To make the Zesty Buttermilk Ranch Dressing, whisk together mayonnaise, buttermilk, vinegar, garlic, chives, grated cheese, and Cajun seasoning in a bowl. Pour into a container with a lid and refrigerate until needed. 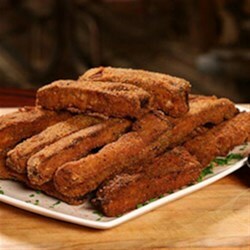 See how to make the famous fried ribs created by Dinosaur Bar-B-Que. If the ribs are very meaty, they may take longer to cook. To prevent ribs from drying out, cover with foil during the last 1/2 hour of roasting. Fried Ribs ? Wow. These were really good. The whole family enjoyed them. The RITZ Cracker Crust is light & flavorful. These will make another appearance in our kitchen.